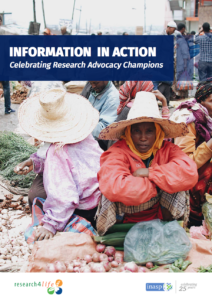 In 2016, Research4Life and INASP launched a competition to celebrate the critical role of advocacy in research and got a resounding response. More than 150 stories rolled in from researchers, doctors and librarians across the developing world. Many of them shared the hurdles they had overcome to boost leadership support for peer reviewed resources and for evidence-based policies based on that critical information. These include resources to improve access, infrastructure and funding, all of which contribute to improved evidence-based health care, agriculture and environmental policies. Alice Matimba, whose multidisciplinary team successfully advocated for a health policy that has transformed the care and treatment offered to patients diagnosed with diabetic retinopathy and other eye complications. Mary Acanit, whose management team successfully advocated for the connection of Kyambogo University to the Research and Education Network for Uganda (RENU), which aims to connect all Ugandan universities, colleges and research institutions via an affordable country-wide high speed network backbone for cheaper & faster access to global research resources. Dinah Baidoo is making sure that the resources that students receive are the most important and most up to date ones available. Enitome Bafor is passionate about getting her students involved in scientific research and showing them how research can do great things for society. Rosemary Thiongo is making sure that the nurses and doctors have access to evidence-based information. Lui Phillip Kame wants to empower people by making the right information available at the right time and easily accessible by those who need it. Mario Heredia created a research platform for his own community in Ecuador. If reading this book inspires you to learn more, whether as a participating institution, publisher, technology partner, journalist, donor, or policymaker, please contact us at: r4l@research4life.org.